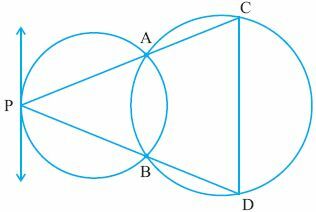 Q 1: Two circles intersect at points A and B. From a point P on a circle two line segments PAC and PDB are drawn intersecting the other circle at points C and D. Prove that CD is parallel to tangent at P.
Q 2: Two circles touch each other at points A and B. At A, tangents AP and AQ are drawn which intersect other circles at the points P and Q respectively. Prove that AB is the bisector of angle PBQ.